Mexican Sage | Easy to Grow and a Real Show Stopper in the Garden! Makes it a Real Show Stopper! 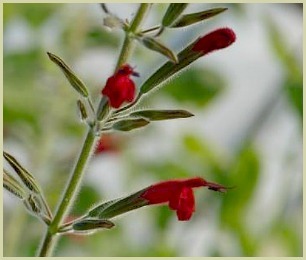 Salvia longistyla, or Mexican sage, is famous for its vibrant deep red colour. Unlike most other sages that bloom in delicate shades of blue, purple or white, this perennial flowers into a shocking blood or wine red hue that makes it a real show stopper in your garden. Mexican sage gets its name from its native country, where it grows wild in the hills and along the coast. Its deep green leaves are almost round, and it offers long tubular flowers that stretch up to four inches in length. And the leaves and flowers have a soft velvet coating which gives them a soft, fuzzy feeling. This shrub has flowers that bloom from late summer through to the fall. With colours that can range from deep reds to the deepest purples, and often the blooms have a white tip on the end. This shrub can grow up to three feet tall and three feet wide. It needs rich, well-drained soil and more watering than other desert sages, although it is still quite drought-tolerant. It can tolerate sun well but also thrives with some partial shade in the afternoons. It's fantastic in containers and does not do well with frost, so planting in a container makes it easy to bring inside when needed. Start your cuttings inside in spring as it needs a long growing season before flowering in the late summer. Prune back some of your branches in the early summer to encourage flowering later in the season. It’s important to give the plant lots of room around it, up to at least five feet of space as it does not like overcrowding. Make sure not to over-water, as it can rot the root system, and cut back close to the ground in the winter if you are leaving your plant outside. If you're interested in growing other types, click here for a detailed guide. But Why Choose This Mexican Variety? Well for one, it's very showy, and attractive to butterflies and hummingbirds. It also acts as a nice burst of colour in your garden at a time when other plants and shrubs are starting to die off. However, one of the nicest things about growing some near your house is that it is a wonderful cut flower as they retain their rich red colour after drying, so it can also be used in nice dried flower arrangements and in pot pourri. Note: There is another variety called Mexican bush sage, which is a different plant altogether. Click here to read about this type.